Use the U.S. Money Visa® Prepaid Card worldwide wherever Visa® is accepted — in stores, online, or over the phone. Pay bills or make purchases wherever you go. Access your paychecks up to 2 days faster. *** Click here to enroll your U.S. Money Visa® Prepaid Card for direct deposit. Reload your card for free and get cash back at any participating Check Into Cash location. You can now save money and enjoy all the benefits of our U.S. Money Visa® Prepaid Card with direct deposit. Direct deposit is 100% free and allows you to deposit all or part of your paycheck, tax refunds, or government benefits onto your card. * Direct deposit gives you instant access to your funds the moment they are deposited — no more waiting for checks to clear. To get started, fill out and submit the Direct Deposit Form to your employer or government benefits provider. All funds are insured by the FDIC. We protect you from unauthorized purchases, fraud, and theft if your card is ever lost or stolen. You can receive SMS text alerts whenever a transaction is made with your card. For additional protection, you can personalize your card. 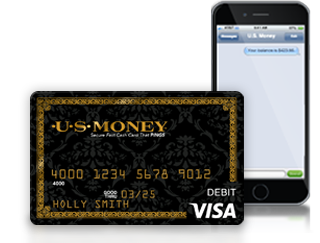 Log in to order your custom U.S. Money Visa® Prepaid Card. Sometimes writing a check is the only payment option. You can write a check using the funds in your U.S. Money Visa® Prepaid Card account with custom checks that are pre-funded for guaranteed payment. To order checks, you can call our Customer Care Center toll-free at 866-872-9820. The U.S. Money Visa® Prepaid Card goes above and beyond other reloadable cards to guarantee benefits for everyone. From teaching your teen money management to serving as your personal preferred payment method — the U.S. Money Visa® Prepaid Card offers financial independence and complete control of your account activity.